Arachnophobia. It is argued to be the highest ranking phobia in the world. This is the fear of spiders. For many people talking about spiders, or even seeing a picture of a spider can be enough to send them into a panic attack, let alone discomfort. It isn’t any wonder why, as there are 35,000 known species of spiders and many left to be discovered. For many people this is a frightening thought. However, around only 30 of those species carry a venom truly harmful to humans. And luckily for you, most of them are in other countries. So first of all what is a Spider? Spiders are part of the class Arachnida. This means they have 2 body segments, 4 pairs of legs( 8 legs), and no antennae. Spiders lay egg sacs, which carry millions of tiny baby spiders, also called spiderlings. They come in all sizes. From a tiny dot to the diameter of a dinner plate. While they seem scary, they are extremely diverse, intelligent, and graceful. One could only be so lucky to observe a spider in the wild. Here in Oklahoma, there are only two species of spider that are medically important, which is true for most of the United States as well. The one that is most spoken about and possibly the most misidentified is the Brown Recluse ( Loxosceles reclusa) also called fiddleback or violin spider. This spider carries a venom that is typically only potent to people with weak immune systems. It is a necrotic venom effecting the tissues. Areas with more tissue are more prone to necrosis than other areas. Just like its name suggests, it is very reclusive. Often found roaming along a wall, or in clothes that have been left on the floor. A bite from a recluse is thought to be uncommon. Its venom has the ability to eat away tissue and if left untreated, cause internal complications. Children and the elderly are more sensitive to the venom. However more often than not, a “bite” is actually a sore or insect bite, that has become infected, which can quickly turn into staph infection. Staph is very common, easy to contract , and has similar effects of necrosis. A mild recluse bite can be treated with an antihistamine. Just like staph the recluse bite wound will fester. This makes for a confusing diagnosis. Observance of suspected bite area is important in case you need medical attention. Since these spiders are so reclusive, they will do their best to stay out of your sight. Therefore, your chances of getting bitten, like I said, uncommon. Identify the spider! If you can, take a picture or CAREFULLY catch it in a cup. And no, a smashed spider does not make for an easy identification. Do NOT wash wound with hot water. Usually hot water will break down the venom in your system. However, in the recluse this only seems to speed the venom to a rapid rate. Use cold water or better yet, don’t touch the bite at all. See a medical professional soon. Just because you are bitten does not mean you need any medical attention. The best patient is one who knows their body. Watch your bite. If you see in color changes( turning to purple or black), then see a medical professional. If you are for certain you were bitten by a spider, try to put an antihistamine lotion on your bite or take Benadryl. And most of all, remember if you did not see the spider bite you or feel it when it happened, then do not assume it was a bite at all. Identification of the spider can also be confusing.The recluse spider comes in many colorations from light tan to dark brown. They can be one or two toned. They also have a violin shape on the first section of their body(Cephlathorax). However, this shape is often lacking in various species/colorations so it is best not to rely on the violin symbol for a secure identification tool. They can reach the diameter of a half-dollar, but can also be very small. They prefer to be in dark areas. Their favorite habitat would be leaf litter in a yard ,in a slightly damp wooded area. During breeding time, males will often be found roaming around in search of females and food. Typically if you find a recluse spider, you can leave it alone and it will go on its way. If possible try to find a container that keeps your hand out of the reach of the spider, and try to take it outside in a tree. Contrary to belief, spiders are actually great for our ecosystem, so always try to save them if you are able to. The recluse is an interesting species because it exhibits a bit of the “opossum attitude”. That’s right, these little creatures have mastered the art of playing dead. You can poke and prod at them, as long as you are in their sight, they won’t budge. Their eyes are on the top of their heads(cephlathorax) so they can only see what is above them. It’s when you sit at their level that they suddenly “come to life” again. Another reason as why you should never pick up a spider if you do not know what it is. Recluses have been documented on many occasions to living over 5 years and going without food for many months up to a year at some points. They have egg sacs which are white in coloration. Soft and hold an estimated 40 eggs each. Like all other spiders they mature gradually molting( shedding skin) numerous times. 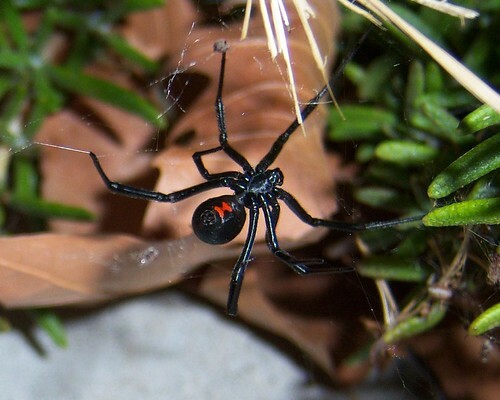 See further articles about other species of spiders commonly found around your home. Any questions of suggestions? Leave me a comment or email me and I’ll be happy to answer all your spider questions. *In Native American teachings the spider is the weaver of the secret language. She weaves her web constantly to conserve and pass on the language to each generation so they never forget their true teachings.